On a routine walk about in Washington Square Park on July 18, 2017, I observed fungal growth at the base of one of the red oaks, a pin oak specifically, in the large NW lawn of the park. I uploaded photos of the fungus to iNaturalist for identification. 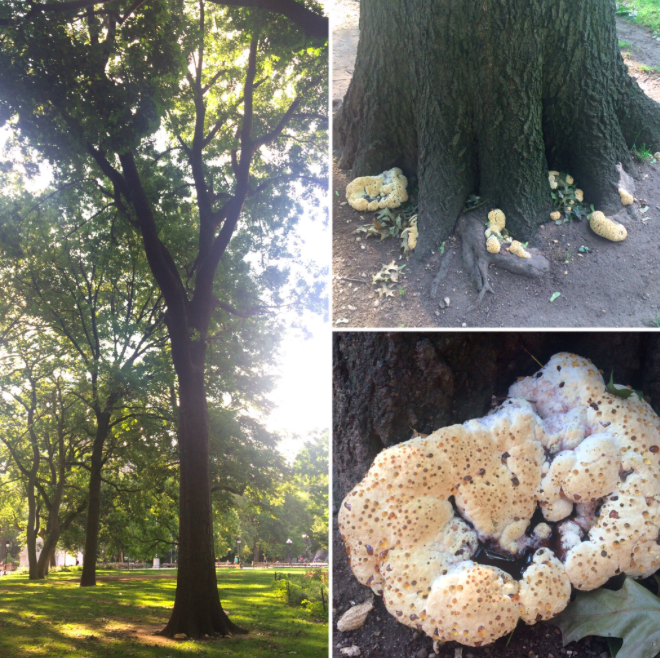 On July 21st, I tweeted photos of the fungus, Oak bracket (Inonotus dryadeus), and the infected pin oak from the WSP Eco Projects account and copied NYC Parks and NYC311. 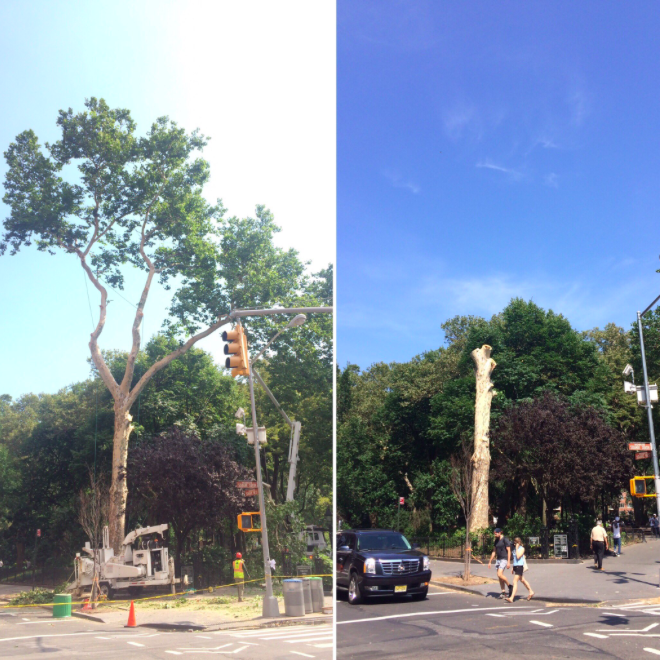 A formal report of the infected tree was made by WSP Eco Projects on July 24th via Twitter DM per request of NYC311. Also, on July 21st, the photos of the fungus, unidentified at the time, were published on the WSP Eco Projects Instagram feed. The WSP conservancy commented that they shared our sighting of the fungus with NYC Parks Manhattan Forestry (Forestry). 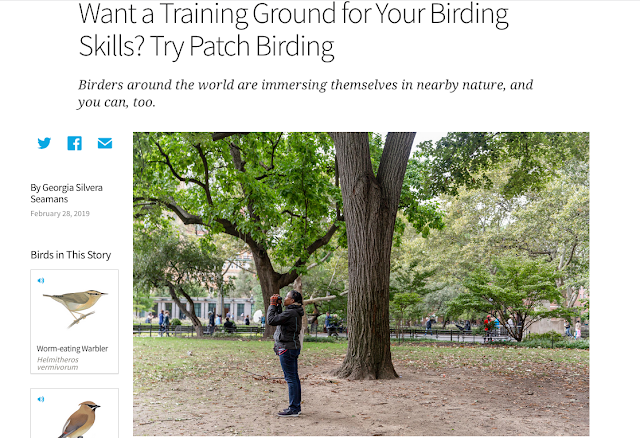 On August 7th, the WSP conservancy announced by email that NYC Parks would begin a course of tree work in the park beginning August 8th. I don't know if the pin oak had been tagged for removal prior to my reporting the presence of the oak bracket. The tree work was contracted to Emerald Tree & Shrub Care Company based in Scarsdale, NY. A double crew performed the tree work under supervision of master arborist Kevin Wyatt and crew leader and arborist Pedro Meza. Emerald Tree Care discovered problems with two additional trees during the course of their work. The large plane tree in the SW corner of the park was found to have rot and a crack in the crown. The third tree to be removed was the smaller of the two ashes in the "webs" playground was removed after buttress root damage and multiple cavities in the crown were detected. Emerald Tree Care communicated the status of the trees to NYC Parks and the agency made the final decision to remove the trees. What were the size stats for the three canopy trees? According to the diameter records in the WSP Eco Map, the plane tree was 47 inches, the pin oak was 28 inches, and the ash was 25 inches. 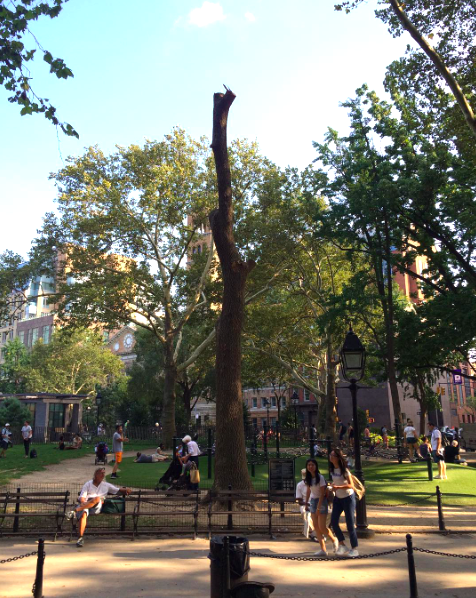 Washington Square Park lost at least 100 inches of diameter urban tree canopy in August. A total of 270 trees were on the original work order, of which three were removed. As most of my readers now, I direct WSP Eco Projects. The Eco Map will be updated to reflect this loss in the canopy. While the park has approximately 35-40 species, several species have many individuals and there is less diversity at the genus level. I don't know when NYC Parks will replace the lost trees nor do I know what species the agency will choose. I hope at least one will be a tulip tree. The park only has two tulip trees and adding a third or more could point to the significance of the park and the tulip tree species in Lenape culture. Washington Square Park Blog also covered the tree work here. A final note, I watched the Emerald Tree Care crews prune and remove trees in the park over the course of a two period. They were professional in their approach to tree care and maintained a safe work environment. What a tragedy to lose such large trees. Your posts about the park are so valuable as advocacy for thoughtful management of public space. Especially so in a small park, Bryony. Thank you for participating in the blog.